With an attractive red colour albeit scaly peel, the translucent white fresh of the lychee fruit offers a taste that’s sweet, tangy and refreshing. With its aromatic scent, the fruit can be enjoyed throughout the season as a timeless treat. Its light, floral notes of rose and pear pair perfectly with other tropical flavours like limes and coconut in a symbiotic fruit mix. Lychee martinis and mojitos give any party a blast. The fruit also goes well in bubble tea or made into desserts like ice cream. 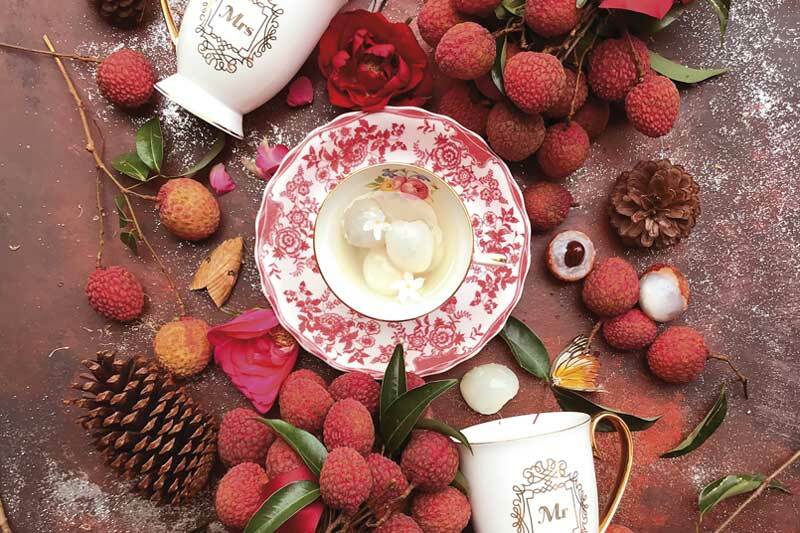 Originating in southern China in the Guangdong and Fujian provinces, the lychee was first introduced to the West in 1656 by Michal Boym, a Polish Jesuit missionary. The fragrant fruit is extensively grown in China, India, Thailand, Vietnam and many tropical and subtropical regions of the world. The rosy-coloured fruit also became a symbol for love after Emperor Tang Ming Huang of the Tang Dynasty arranged a special courier service to deliver the fresh fruits hundreds of miles from South China. A quick delivery got carried out to the Imperial court in the North before the fruit got spoiled to please his favourite concubine Yang Guifei, considered one of the four most beautiful women in ancient China. A popular lychee variety is named Fei Zi Xiao, or the concubine smile, after legend. With over 40 varieties of lychee worldwide, Thailand has: Hong Huay (from ablong, conical to heart-shaped with a thin skin, sweet and sour properties and aromatic); Ohia (heart-shaped, thinner skin, a soft and thicker fresh, sweet); Emperor or Jakkraphat (huge, thick skin, pinkish red, sweet, juicy) and Khom (heart-shaped, reddish-pink, juicy, and sweet). Apart from its enticing taste, the fruit has vitamin C, vitamin B complex. The beneficial presence of copper, phosphorus, and polyphenol oligonol gives it antioxidant and anti-viral properties. It’s said that the lychee aids in weight loss, protects the skin, and boosts the immune system. Eating a lychee can be a preventative measure for cancer, improve digestion, lower blood pressure, improve circulation, and optimise metabolic activities. With its delicate and lingering taste, the lychee has put a smile for hundreds of years on many faces.